TechRadar recently was invited down to the Barclaycard Wireless Festival in Hyde Park – but this time it was wireless with a difference. The organisers had written to all the festival-goers ahead of the event and asked if they'd like to enrol in the PayBand scheme, which allowed them to charge an NFC-enabled wrist band with money and also add in elements like Facebook integration too. Each merchant at the festival was equipped with the ability to pay with the contactless technology, meaning users would be able to leave their wallet at home for the duration of the event. 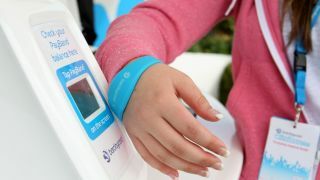 John Conlon, Head of Future Propositions – Digital Payments for Barclaycard, told TechRadar: "Festivals are the perfect scenario to show off this technology. "People don't want to come to places like this, and queue, people come to have good time, drink and watch music, so [the Wireless Festival] is a good example using contactless technology to give a better time." "In the future the same technology could be used at other places like sporting events too; basically anywhere that you don't want to queue for cash is perfect for PayBand." The Barclaycard PayBands themselves were rubber bracelets, similar to a watch-style accessory, and came in blue, green and pink to denote different levels of functionality, with those not wishing to cash-enable their wrist still able to gain entry to the Barclaycard Unwind perk park. This area showed the extra elements that users can work with – by synchronising their PayBands with their Facebook or Twitter accounts ahead of the festival they could take photos in a special booth and have them uploaded to the social sites without the need for a phone. "The response has been on social level so far," added Conlon. "It's been fantastic, activation rates for social networking have been very good so far, almost 80% of PayBand users have associated them Facebook." The social aspect was more of an 'added extra' rather than a main draw though – the real reason to try the technology is to ditch the wallet. To that end, the main hurdle is registration. While it could be done onsite, users should have associated a card with their PayBand ahead of the event, stating whether they want to place a fixed amount on the card or have an auto-top up in place. The latter option is one Barclaycard was keen to see in use: if a pre-defined limit is reached, the PayBand will be automatically topped up with £20 (plus an extra £5 from Barclaycard as an incentive). Users could head on over to one of the top up tents to check their balance or add some more cash if they were getting low by logging in to one of the terminals to choose how much more cash they needed. What was great about the festival was the merchant education on the subject of NFC. There was no sign of the embarrassment we've encountered on the high street trying to pay for something with a phone or wristband – when you held up your arm the vendors were happy to pull out the terminal to get you on your way. The process was incredibly simple – once tapped it was a couple of seconds before the transaction was all complete, thanks to not having to ask to use contactless payment ahead of the purchase. The security of not having to worry about the wallet was helpful too – even in the unlikely event of losing the band (they were pretty hard to pull off accidentally) you could have them deactivated at any time, rather than losing a wallet full of cash. We tested the BarclayCard PayBand against the Visa Contactless Payment system on the Samsung Galaxy S3, and while both were equally as swift (and the phone allowed you to see your balance without having to wander off to a tent) it was still another thing to lose at a festival. Overall, it was really great to see contactless technology used on such a wide scale as it helps with the most important part of rolling out NFC payments: consumer education. Those we spoke to using the PayBands were really in tune with the way it can help the festival experience, and while the bands were deactivated (and funds returned to festival-goers) on Sunday night, the chances are those signed up will be much more likely to keep using their contactless account in the future.